I’ve always found that the most difficult meat to cook on the parrilla is chicken. It requires a quick burn, followed by slow and easy heating so that the juices of the chicken perform their magic without oozing out. I prefer a whole chicken that I buy locally. I wash it thoroughly and cut myself. Here’s any easy “how to” from CHOW. I next make a rub: a whole lemon and enough oil to cover all the chicken parts, herb de Provence, cayenne, salt and pepper. I let the chicken sit in the refrigerator, covered, but when I go to light the parilla, I take the chicken out of the refrigerator, uncover it and let it come to room temperature. 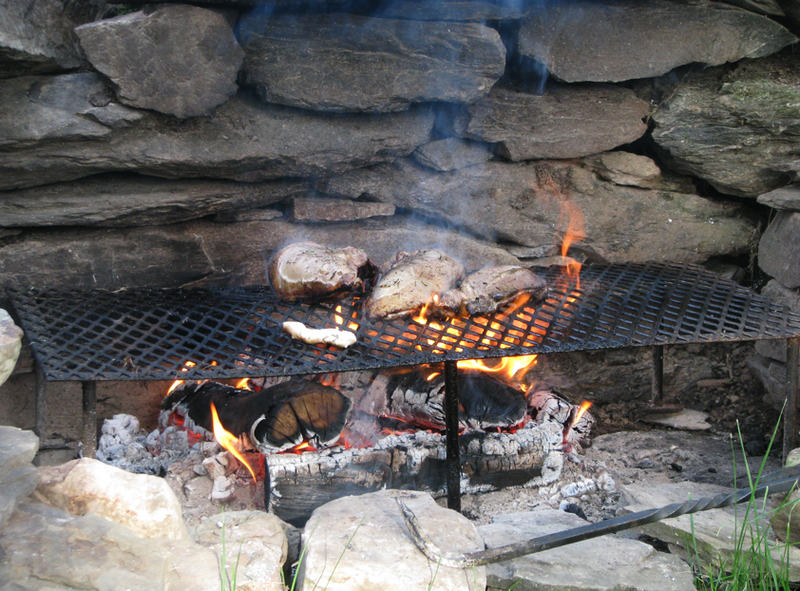 I use extra wood for chicken to make sure I’m going have plenty of charcoal. Maintaining a level heat is critical. I chose some birch, maple and cherry for this burn. I place the chicken right on the flame, burning hard and fast. I want to seal the juices. You have to stay on top this because you don’t want to over-burn. Stay on it! Don't Let it BURN! 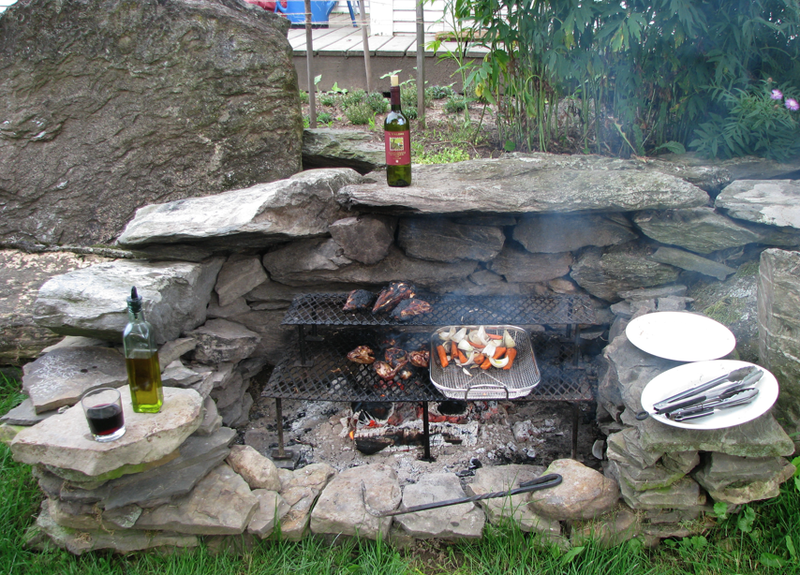 In this next stage, I place my second Parrilla shelf on the original grille or parrilla and move the large breasts to the top. This is when the wine come out and I sip — a Malbec of course. I then place the smaller legs and wings — and a small piece I cut off for my Nina, who was starving — on the lower parrilla. I add vegetables too. These are simply onions and carrots, also local (we’re waiting for these to pop from our garden), touch them up a bit with olive oil and sprinkled some pepper and a dash of cayenne. I have a grille rack, given to me by my daughter, Chelsey, that I use for vegetables and any small items that may fall through into the fire. By this time, I’m already into the nectar of the gods, the Malbec. Finally, we’re done — it took about an hour’s time, after the lighting of the fire. The lighting took about 30 to 40 minutes, giving us time to chat and dream. My sisters-in-law complained mildly that it takes too long. But this is the point — slow food. The wood is burned to create coal; then you order the coal about so that you have different cooking heat levels across the parrilla. In the above picture, one can see buns, burgers and swordfish all cooking at the same time. It’s only possible when heat is distributed. The other fine result is that the food tastes great. This is always immediately noticed — usually the first or second comment. It’s because of the wood, in this case coming from my land. In fact, the only non-local item in this asado is the swordfish, brought to us from Harbor Fish by my sister-in-law who lives in Maine (it’s local to her). I made my parrilla following the advise of my family, emailing me directions from Buenos Aires. They sent me some links and I followed some design options from Casa Original. 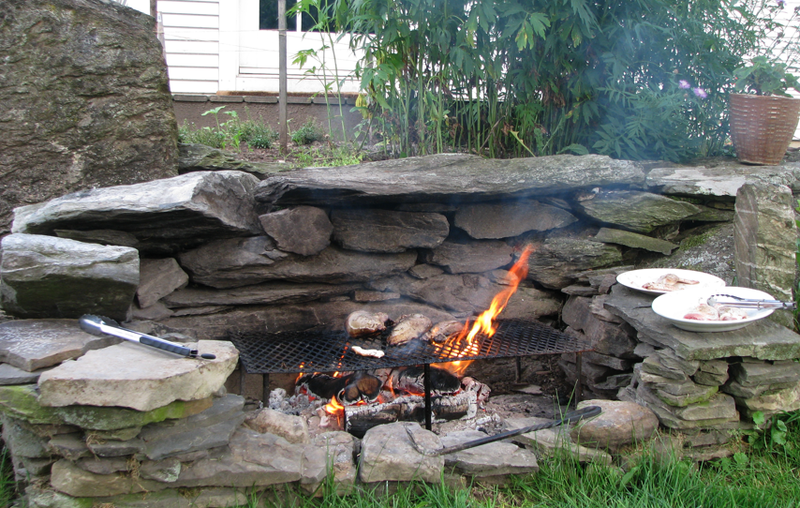 My parrilla is approximately 7″ high, 32″ long and about 18″ wide. It’s also a double decker, meaning that the deck on top is half the size and is also removable. This allows for the moving of very slow cooking food to another level. 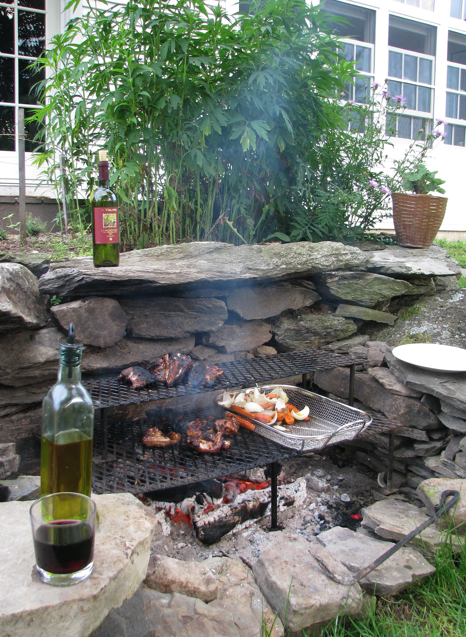 The parrilla was welded together, following my design, by Brown’s Welding, Bristol, Vermont.